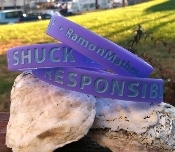 My all new "Shuck Responsibly" silicone bracelet. Made from the highest quality silicone, debossed and printed in two shades of orange. It's a fashionable way to show everyone that you support our environment and care about the Chesapeake Bay Oyster population. Wear em' with pride, and please Shuck Responsibly!